October 1, 2013 was the day my book, The Mommy Advantage: How Having Kids Can Make You Happier, Healthier, and Wealthier, became a #1 best seller on Amazon.com. It was a very exciting and successful day that was the culmination of many people’s efforts. On the anniversary of that special time, I wanted to share with you some very private, behind the scenes sneak peeks of my personal journey. There were three great aspects of my book launch experience and best seller campaign that I want to mention so that whenever you are setting, reaching, or celebrating your goal, you keep these in sight and reflect on them often. I pray that they will bring you great joy, success, and meaning in your creative work. I was convicted to teach parenting and empathy many years ago when my grandfather had just died and my father was in ICU with a stroke. My family, my church, my friends had all been encouraging and sympathetic, but only in a free community parenting class (offering free childcare for my toddler) with people I had only seen a time or two did I feel deeply understood. I decided to write a book, and even put #1 Best Seller on my vision board. I put it all in God’s hands. He had put it on my heart in the first place. 2013 was as busy a year as any. Coaching clients, growing my business, raising kids, managing my household, and launching a book. It was a bit of a blur, requiring/mandating/necessitating focus to pull everything together. I had to be focused in order for it all to work. There were times when I wanted to stop. My father died earlier in the year with my mom and me at his bedside. The Mommy Advantage was supposed to be launched closer to Mother’s Day in May. It was too much for me, so we postponed to October 1. I was able to focus on what was important at the right times and keep going so I could cross the finish line. Thank you to my husband, to my kids, to my mom and grandma who supported me and were so proud of me. 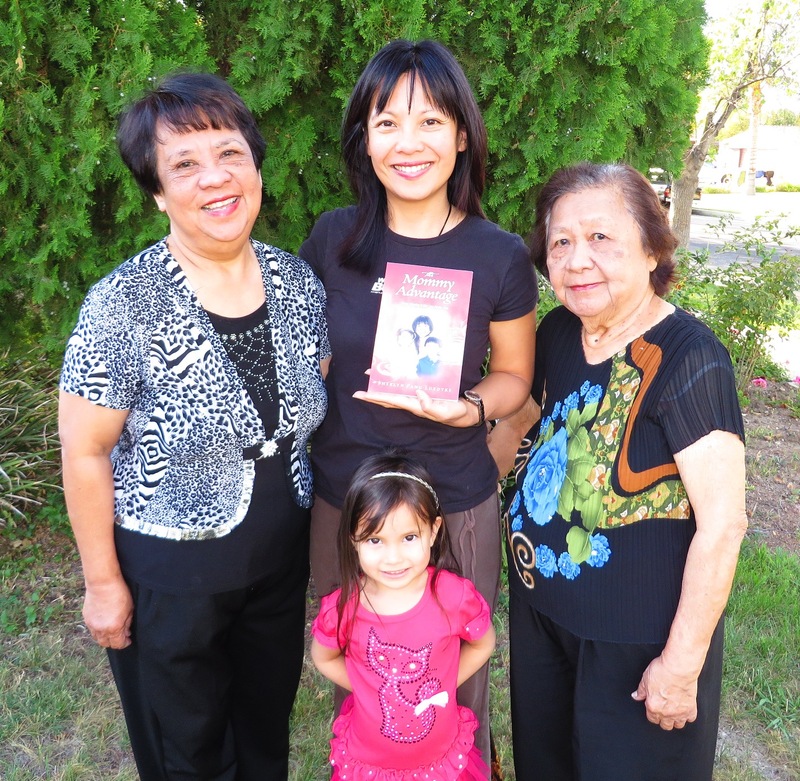 I am so grateful for my extended family who participated in the launch along with me. I greatly appreciate my professional family: mentors, colleagues, and joint venture partners who contributed bonus gifts and sent out emails for The Mommy Advantage book launch around the world. Thank you to everyone who bought the book. I had woken up at 3:00 am in anticipation. My mom and grandma spent the day with me as we watched the book climb the best seller charts until it hit #1. Thank you, Heavenly Father, for granting this desire. It was surreal. It was a milestone. It was a dream come true. It was a blessing. And my family was there to share it with me, in person and virtually. You might be wanting to do something bold. You might be in the middle of your leap of faith. If you are wondering whether or not you are going to be successful, remember to “Commit to the Lord whatever you do, and He will establish your plans.” (Proverbs 16:3) Go for it! Please comment below and share what encourages you most as you go for your big goals and dreams. I wish you all the best as you live out the divine mission you have been given. This entry was posted in General and tagged child, Children, Happy Mother's Day, mom, Mommy Advantage, mother, parent, Parenting, Present Parent, Present Parent Training, Sherlyn Luedtke, Sherlyn Pang Luedtke, Success. Bookmark the permalink.